So these aren't exactly the most glamorous yoga photos ever (!) but they show some really effective postures. So they're making up the next in our ‘yoga for hunched winter shoulders’ series. the muscles across the front of your shoulders/ chest can get tight and shortened. So here are the two things I do over and over again to disrupt those postural habits. The top two photos are the same posture but on different sides, so you can see what I’m doing. Make sure the elbow of the arm on the floor is above the level of your shoulder- if it’s in line with your shoulder or below you won’t affect the muscles we’re trying to target. Start lying on your front and then super slowly and gently roll towards that side of your body. You might find your body doesn’t roll as far to the side as mine does, or that it goes further. It doesn’t matter either way! Just be mindful that you’re rolling your whole body weight against your shoulder girdle, so while this is a great stretch for your pecs you do need to be gentle with it. Roll towards the arm on the floor until you feel the amount of stretch you want to feel in that side of your chest, and then hold there. Take a few deep breaths up into that side of your chest and then repeat on the other side. This should help relieve tension in the tight muscles in your chest. The bottom photo here shows a simple locust pose. Make sure your palms are facing the floor, and as you lift up concentrate on squeezing your shoulder blades together and drawing them down your back away from your ears. This is a super simple but effective way to strengthen those muscles we’re trying to target in your upper back. Lift up for a few breaths, rest then repeat. You could do these at home in five minutes, a few times a week. Try it for a month and see if you feel like you're standing up any taller.... And just ask if you have any questions! It seems to have become winter in the space of a week here in London. And I'm seeing my students (and myself) arrive at class with arms crossed and shoulders hunched up against the sudden cold. So we've been doing a bit of work in class to undo that tension in people's neck and shoulders, and here are some of the actions we're using. Although I'm showing them seated here, in class we've mainly been doing them in standing postures like high lunge and warrior 2. And if it's summer where you're reading this, obviously they work just as well in warm weather too! Photo 1: This one is great for warming up your shoulders for binding postures. Hook your left arm behind your back and catch hold of your right upper arm. Pull your right fingertips straight forwards. As you pull your right arm forwards, it'll make you want to turn your chest to the left. Resist that! Pull forwards with your right arm and take a few deep breaths up into your chest. Repeat on the other side. Photo 2: Reach your arms out wide, then hook your right elbow over your left. Squeeze your elbows together and (if possible) bring the backs or the palms of your hands together. Lift your elbows slightly and then strongly draw your shoulder blades away from your ears. Tilt your arms a little to the right, and lean your left ear towards your left shoulder. Take a few deep breaths into your chest and then repeat on the other side. Photo 3: This one is super simple, and probably doesn't need much explanation. Just make sure your top palm is facing towards the floor - that'll help your shoulder blade to move in a way that will facilitate reaching that top arm. Breathe into the left side of your ribs, then repeat on the other side. Photo 4: Clasp your hands behind your back, and then bring the fist that your two hands are making into the left side of your waist. Keep lengthening up through the back of your neck, and then squeeze your elbows towards each other. On this side it'll be easier to move your left elbow, so make sure your squeezing the right one in too. Breath up into the sensation in your chest, then repeat on the other side. 1. Sit on the floor with your legs out straight in front of you. Take your hand to your lower back: if you can feel your vertebrae sticking out (instead of your lower back having its natural inward curve) sit up on a block/ couple of books/ folded up towel/ something like that. If you still can't sit up straight bend your knees until you can. Leave your right leg where it is. Bend your left knee and step your left foot to the outside of your right thigh. Put your left fingertips on the floor behind you. As you inhale push down into your left hand and sit up tall. As you exhale turn towards your top knee and either cradle it with your right arm or put your right elbow on the outside of that knee. For your next five (slow!) breaths: each time you inhale sit taller. Each time you exhale turn a bit more towards your top knee. TIP: notice how it's easy to sit tall through the left side of your torso by pushing down into your back hand. See if you can also create the same amount of lift through the other side of your torso. 2. As you inhale release the twist and face forward again. Bring your left foot back to its own side of your bottom leg. Keep your left knee bent but this time let your knee fall out to the side. If it doesn't reach the ground support it with a pillow or rolled up towel. Turn your chest to face towards your left knee and place the back of your right hand on top of your right leg. 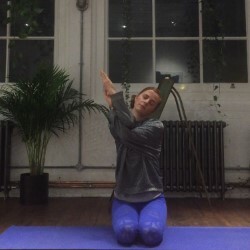 Keep facing towards your bent leg and as you inhale sweep your left arm up alongside your ear; as you exhale bend sideways towards your extended leg. Take five slow breaths here. TIP: notice how your top shoulder wants to drop forwards so your chest turns down towards the floor. Try to resist the temptation to do that; instead back out of the posture a little and turn your chest more up to the ceiling. Lean your top shoulder a little bit back. You might not be able to reach your top arm so far but the stretch will be more in the side of your body (which is what we're trying to target here!). 3. As you inhale, lead with your top arm to come all the way back up. Keep your legs where they are but this time turn your chest to face towards your extended (right) leg. Again, remember that slightly bending that leg may help you sit up taller. Place your finger tips either side of that extended leg. As you inhale sit tall; as you exhale turn more towards that leg and fold (= yoga jargon for lean your chest down towards your leg!). Hold for five slow breaths. As you next inhale sit all the way up again, and repeat the whole sequence on the other side.